Passionflower is one of the most exotic flowering vines available. It's a fast-growing tropical prized for its tolerance to heat and humidity. 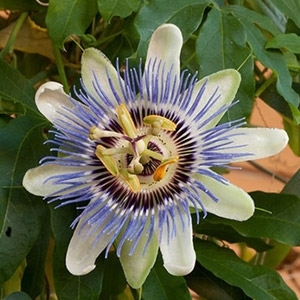 There's also a wealth of varieties available; you can find passionflowers that bloom in shades of blue, purple, pink, red, orange, white, and even yellow. Most types love full sun, but there are varieties that prefer some shade in the heat of the afternoon.